The reach of procurement within an organization is expanding. Procurement is now responsible for purchasing, supplier relationship management, ensuring internal and external compliance and controlling costs and spend. Many procurement teams are struggling with these added responsibilities and are facing a huge uphill challenge to meet their new demands. Traditional, manual procurement processes rely heavily on phone, email and paper-based communication for requisitions and order management. These processes are time-consuming, cause errors and offer very little insight into the process. 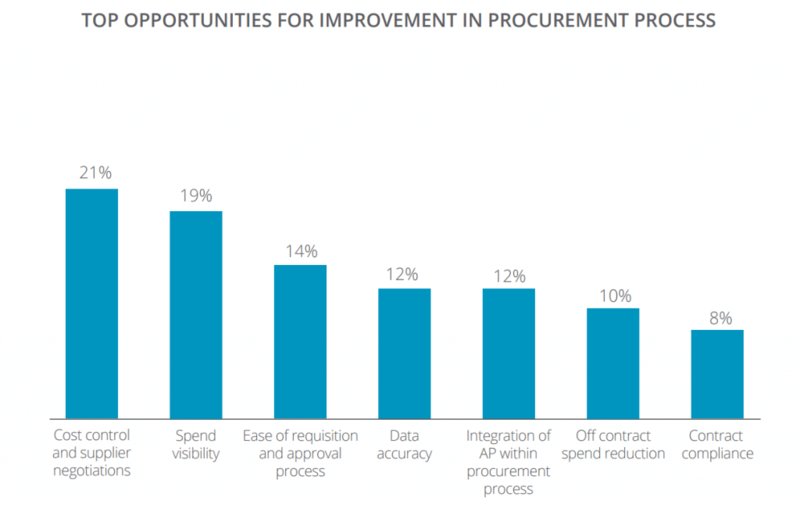 The graph below shows the areas that procurement teams would like to see the greatest improvement in their process over the next 12 months. Best in class procurement teams are overcoming these challenges by restructuring the way that they deal with key stakeholders such as suppliers, automating minimal, time-consuming tasks and controlling costs. Procurement teams interact with suppliers on a regular basis, so it is imperative that the relationship is a strong one. While procurement teams are becoming more and more digital, they also need to digitalize their most valued relationships. Manual processes for onboarding and interacting with suppliers are costly and can lead to errors further down the line. Once procurement teams have identified their preferred suppliers, their objective should be to spend 80% of their total spend with them. 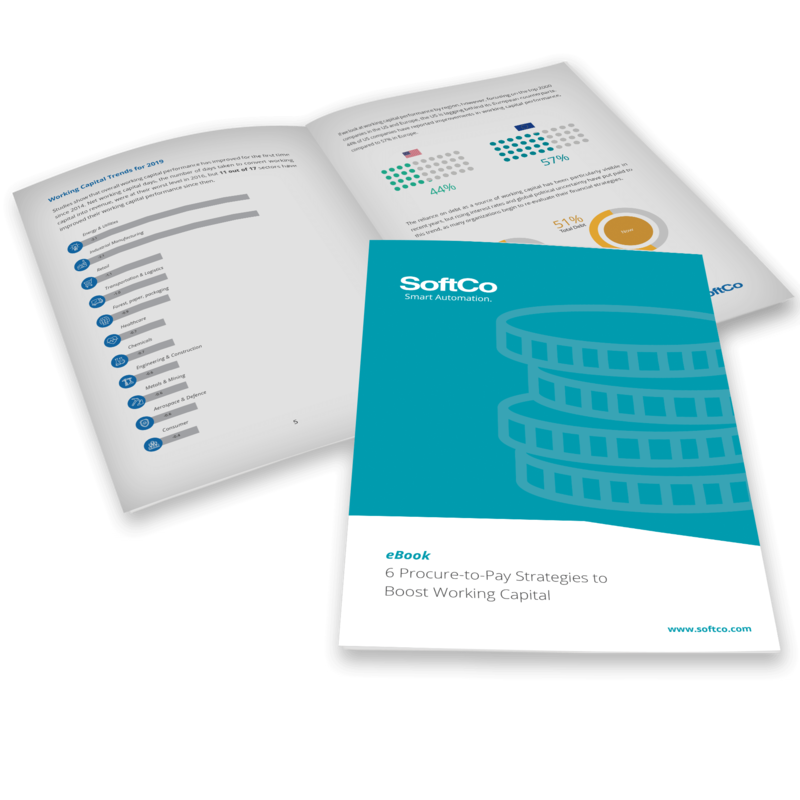 Focusing on preferred suppliers allows organizations to unlock a number of benefits including unlocking pricing discounts and quicker ordering and invoicing. Onboarding new suppliers can be done through web forms versus paper applications where data would have to be manually routed through the organization and entered into the ERP system. Interacting with suppliers can and should be done within a single platform where dialogue can be tracked as opposed to a chaotic fashion involving phone calls and email attachments for requisitions. Manual processes can lead to lengthy delays and missed opportunities. Updating these process can save time and remove data inaccuracies. With this said, procurement teams have to be cautious when restructuring their relationships with suppliers. The goal of increasing competition can often come at the cost of damaging the integrity of partnerships. Unless you have been living under a rock for the past number of decades you’ll have noticed the impact that technology is having on our personal and business lives. The impact of technology has certainly been noticed within the procurement space, where the term ‘eProcurement’ has been born. A report by Paystream Advisors found that eProcurement Adoption Rates Have Increased from 34% in 2016 to 53% in 2017. These organizations are leveraging solutions to reap a number of benefits including improved control, visibility, and profitability. The process of creating requisitions is made quicker and more efficient. eProcurement solutions allow non-procurement staff to easily select a product or service, create a requisition, and send it for approval. 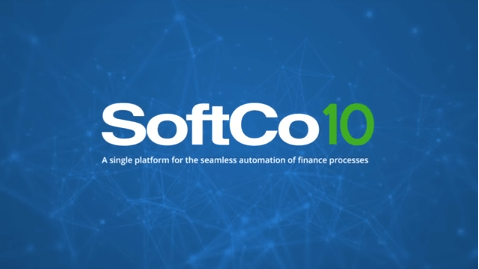 Easily configurable workflows can be implemented to ensure that any spend is allocated to the correct cost center, geography, and general ledger. Approval workflows can also be configured to ensure that each requisition is approved by the correct people before a PO is created. This post will only scratch the surface of the value that technology can add to procurement. 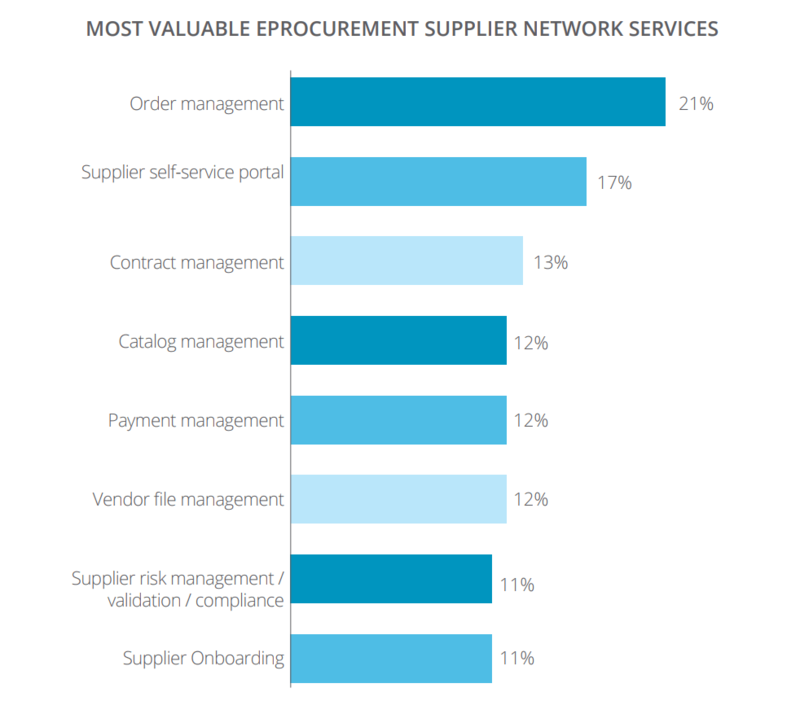 The graph below demonstrates the variety of different areas that organizations have been able to approve because of technology and in particular, eProcurement solutions. When an employee creates a requisition they can often accidentally break company buying guidelines. Often unbeknownst to the employee, they may spend above their budget, send a requisition to the incorrect approver or allocate cost to the wrong cost center or general ledger. Moving forward, it will be important for procurement teams to create a process where users are ‘guided’ through the entire buying process. 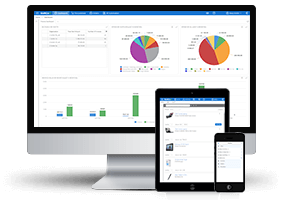 Best in class organizations have systems in place where a user can choose products and services from only preferred suppliers, automatically create a requisition with the correct product details which allocate costs to the correct cost center and GL. 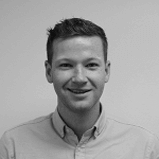 Approval workflows can be used to ensure that the correct people approve the requisition before a PO is created. Procurement teams are responsible for the overall company’s spend. In traditional organizations where purchase orders are paper-based, there are no approval workflows and no cost allocation process, this can be tricky as visibility into the process is minimal. Best in class procurement teams are investing heavily in reporting and analytics. Procurement teams that have visibility into the procurement process can pull real-time data on KPIs on metrics such as spend per employee, cost center or department as well as time to process POs. This allows procurement leaders to spot inefficiencies and find areas for improvement and development. Non-trade spend on products and services such as stationery, electricity bills and cleaning services are an area that can often be untracked and in turn, costly. Maverick spending means that this bracket of spend is often paid for using petty cash or credit cards. Best in class procurement teams are finding that this is an area where savings can be made. Organizations that add a formal PO process to their non-trade spend typically reduce spend by around 3%. Growing demands are putting a strain on procurement teams and unfortunately, many are struggling to fulfill their requirements. We mentioned earlier that 53% of organizations are now leveraging technology to enhance their procurement process. These best in class organizations have left behind manual, time-consuming processes. These organizations are now experiencing exponential benefits such as increased data accuracy, optimization of supplier base, and increased visibility into and control over spend.